Love using stickers in your planner to help keep things cohesive? This decoration set is the perfect mix of function and decoration to keep your week cohesive and enjoyable! Pair with our Functional Sampler Sets or use on their own - the possibilities are endless! With this set, you will receive four long strips of stickers in a monochrome color of your choice, with the larger strips featuring our signature stripe design. Also included are a variety of coordinating functional stickers such as checklists, half boxes and event stickers. 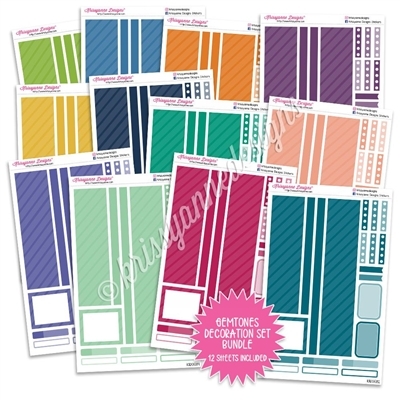 This set was designed to fit Erin Condren Life Planners in the Vertical and Hourly layout, but have been known to work in a wide variety of other planners as well.